Within an hour of leaving the Piedras Blancas Elephant Seal Rookery in San Simeon on November 3, we arrived at our Morro Bay hotel. 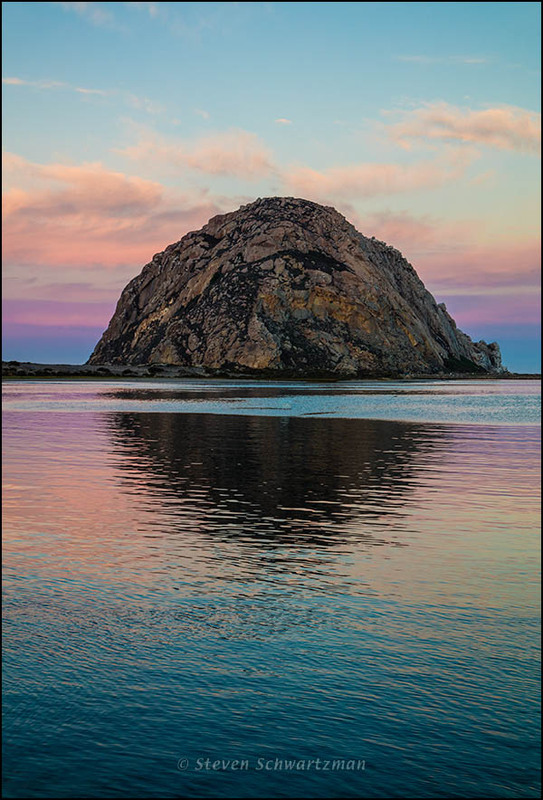 It was close to the coast, so when I awoke early the next morning and saw some color in the sky, I hurriedly walked the few blocks to the water in hopes of recording the famous Morro Rock at sunrise. I think this was the only time in my life I’ve done back-to-back sunset and sunrise pictures. No wonder Homer said “rose-fingered dawn”. I like your Classical reference. I haven’t thought of that epithet in years. I wonder if the sea beyond Morro Rock looked wine-dark. When I started college, the first book assigned in the required Humanities course was The Iliad (Richmond Lattimore’s translation). I imagine the ancient Greeks who lived by the sea became much more attuned to its nuances than could be caught by as simple a description as blue. And as you who love the sea must likewise be attuned. I must say, it all started with this article. Can you imagine 🙂 Because this article was so interesting. I read this in January this year and had an epiphany that “sea is the one” that I want to write about, that I want to explore through the stories of other writers and through living side by side with the sea. When I discovered, that Caroline Alexander, the author of this article, has made a brand new translation of “Iliad”, I started my voyage with this classical text. And everything else grew out of it. And it’s just the start. And an excellent start. May your quest fulfill you. and by the things I found along the shore in various places. Just when I think you couldn’t possibly outdo yourself, you outdo yourself. I didn’t think anything could be better than the leafless aspen. Then, I thought nothing could be better than Cathedral Rock. Now, I’m thinking nothing could be better than this. The colors, the rock, the reflections, the ripples: it’s perfect. I’m afraid I’ll be pushing my luck after the trifecta you’ve mentioned. I see some pink in the sky outside my window in Austin as I write this, but it’s not the same. This is the absolute best photograph of Morro Rock I’ve ever seen. Great job Steve! Thanks, David. I’d passed by Morro Rock two or three times in earlier decades without spending any time there. It’s a good thing we stayed the night so we could explore a bit in the morning. I didn’t notice anyone meditating there, Sally, but you could have if you’d gone there in the quiet of the early morning. Thanks, Steve, not only for this one but for all the other fantastic sights in this series! You’re welcome. I still haven’t come back down to earth from this trip. Plenty more pictures from it will be coming along, easily extending into 2017. You just gave me one of the few reasons to be looking forward to 2017: let these pictures come! Great quotation. Let’s keep our hope up. 🙂 You wouldn’t wish to be here this week~we are “enjoying” single digit temps, snow and wind. I’m hibernating. My heart would take a definite leap down if I had to endure it. That’s why I moved to Texas 40 years ago. That was a wise move on your part. It was the wisdom of a cold-sensitive body. Much to my son’s amusement I have deleted all of the Wisconsin homes I was saving. Too bad because several of them I could nearly afford but this is too much for me. It happens every year and yet I seem to forget. Your winters can easily turn an optimist into a realist. As much as the Midwest winter can get anyone down, have you drawn or painted any views of ice that caught your fancy? That would be a silver lining, so to speak. I am working on an oil of the Des Plaines in a snow storm. It was a lovely day, much warmer than the past few days. Another effect I would like to capture is when an ice storm coats everything in ice. It looks stunning against a dark winter sky. Great. We’ll look forward to seeing your winter work. Great rock and even greater background. What a great lot of color you captured. Great shot. Great, great, great. I hope too many greats don’t grate you. I don’t find it at all grating, coming from such a great portrayer of sunrises. That’s a much more impressive photo of the rock than mine! You definitely had better weather along the PCH. I did there, but not in some other places that we visited. On a long trip a traveler inevitably encounters some stints of bad weather. This picture certainly did show me what heaven looks like. Magnificent colors, and magnificent portrayal of the water itself. Thanks for your appreciation of this sunrise image. Had I set out a few minutes later or walked not so quickly I’d have missed it. “There is yet a light,” says Ruskin,” which the eye invariably seeks with a deeper feeling of the beautiful, — the light of the declining or breaking day, and the flecks of scarlet clouds burning like watchfires in the green sky of the horizon.” The colours of the sky seem to lighten up the earth, and “the orange stain on the edge of yonder western peak reflects the sunset of a thousand years.” Sunsets are so beautiful that they almost seem as if we were looking through the Gates of Heaven. I rarely go out photographing that early. This time was worth it. Special they are. Going out early was worth it. Superb subtle colours in this classic shot. Such a shame that the WP reader ‘refreshed for 2017’ by the geeks in WP now crops portrait mode images by taking a slice out of the centre of the image thus decapitating the rock. I’ve almost never used the WordPress reader, but I took a look just now and I see what you mean about the decapitation and depeditation of vertical images. I agree with you that changes aren’t always for the better. I still prefer WordPress’s old editor to the “improved” one. In any case, I’m happy that you like this early morning view of Morro Rock. Wow great picture. My first time seeing it we just drove through. Would love to stop and visit the area. and the morning sunrise proved an excellent bookend.